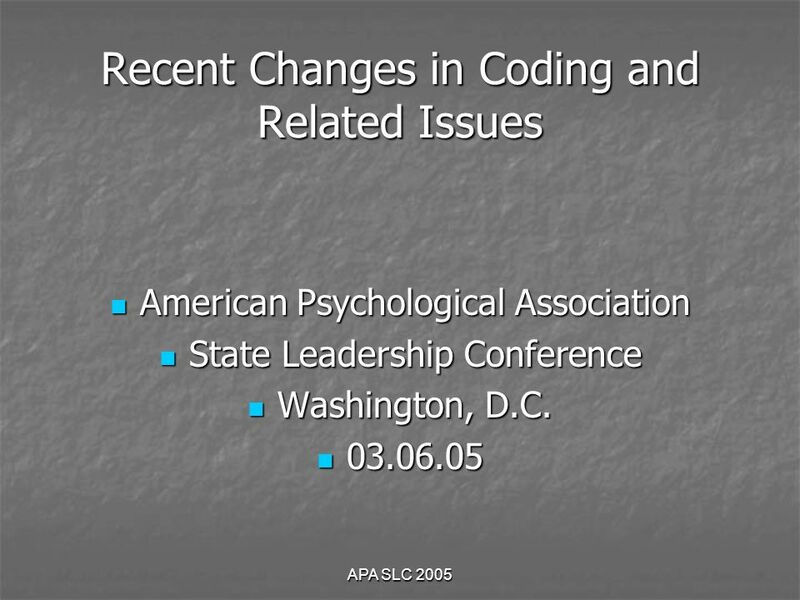 APA SLC 2005 Recent Changes in Coding and Related Issues American Psychological Association American Psychological Association State Leadership Conference. 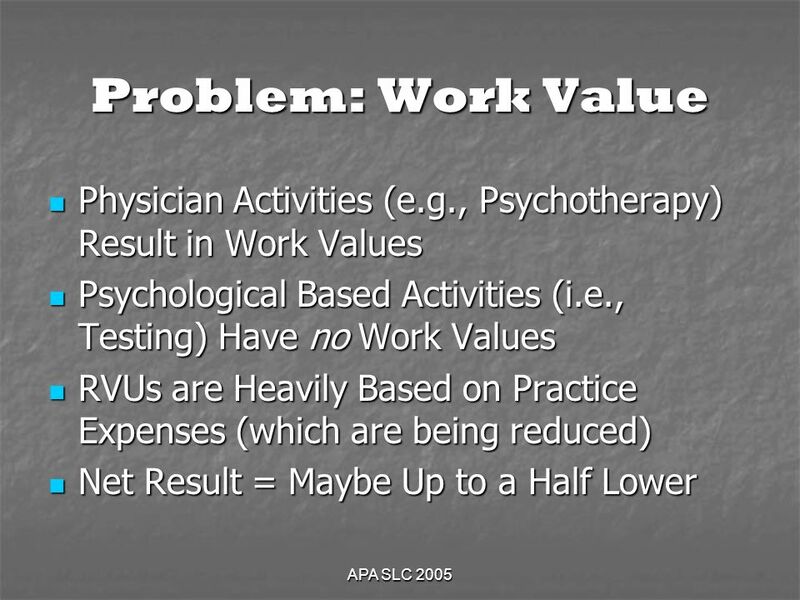 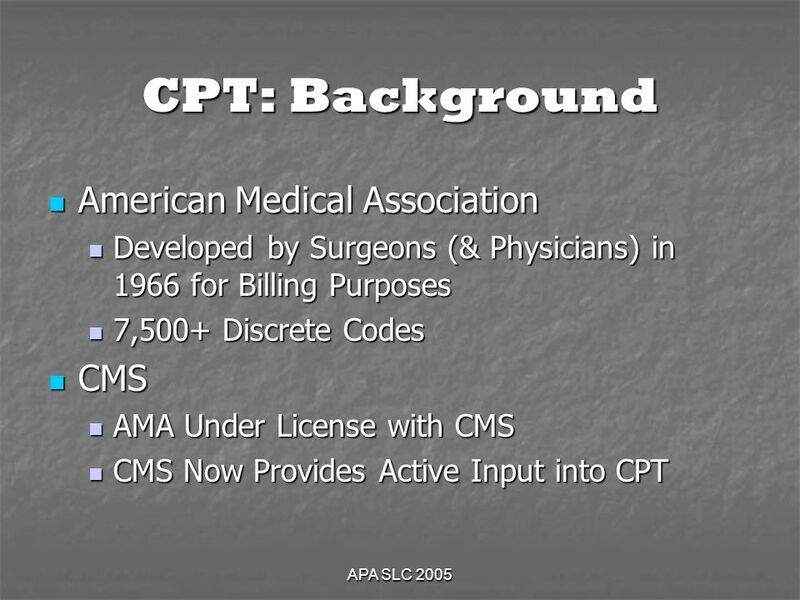 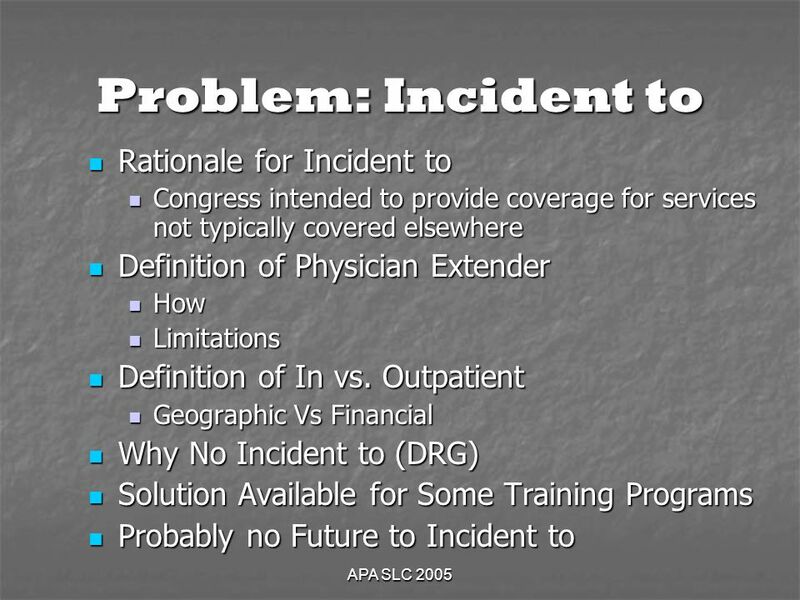 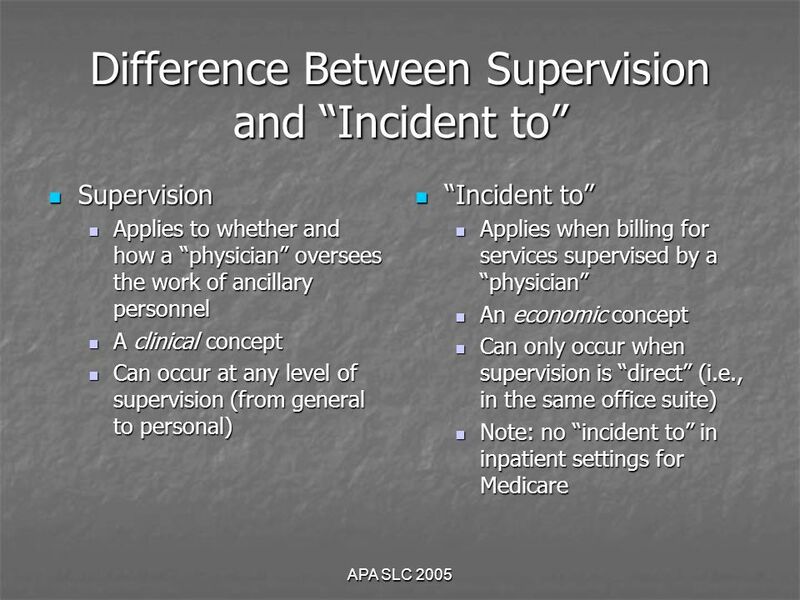 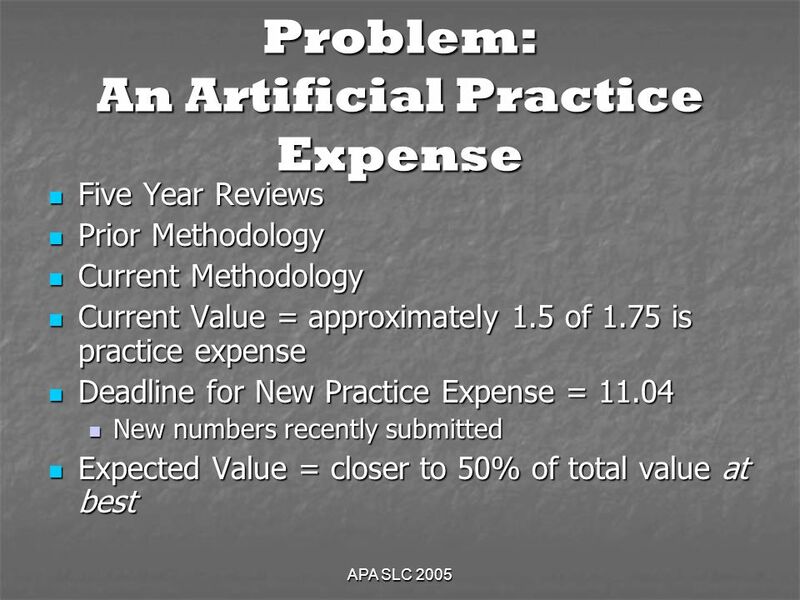 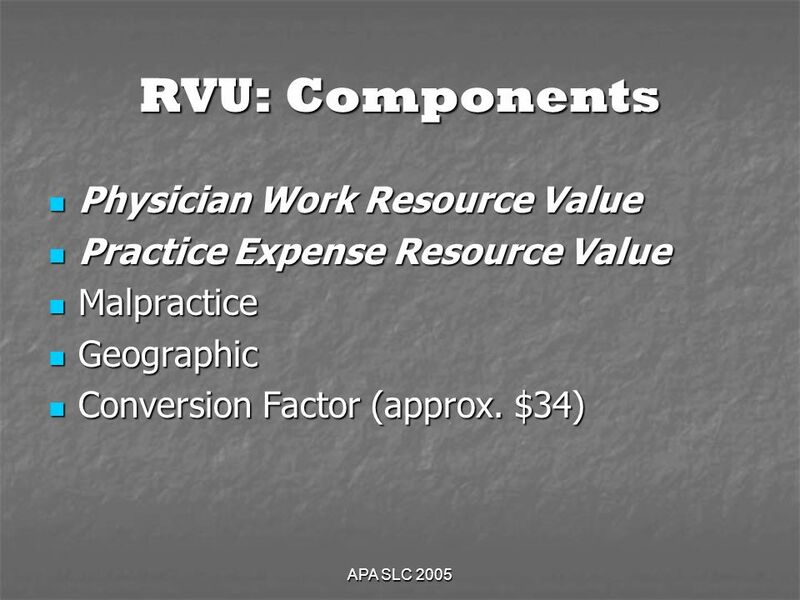 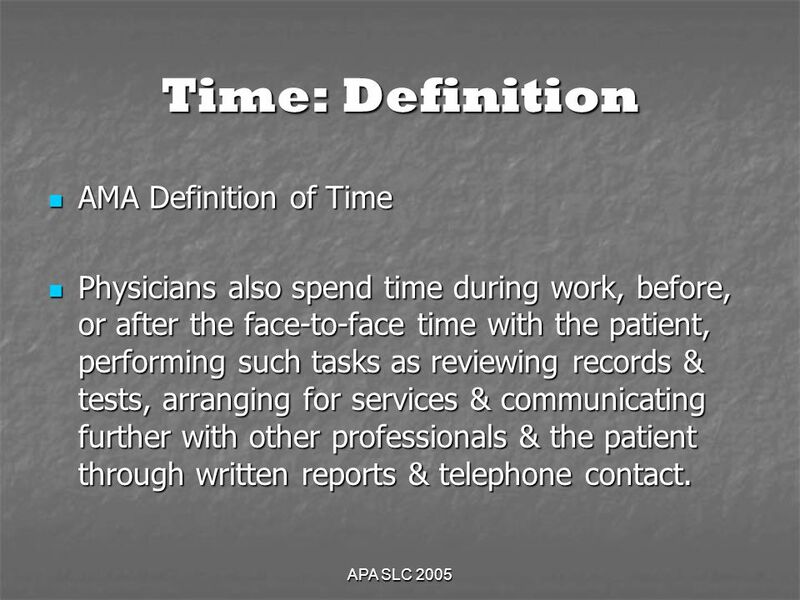 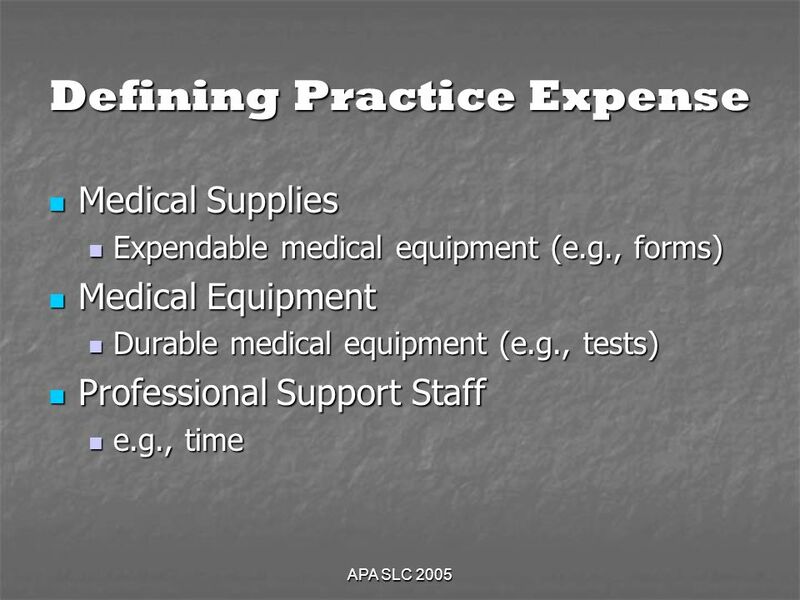 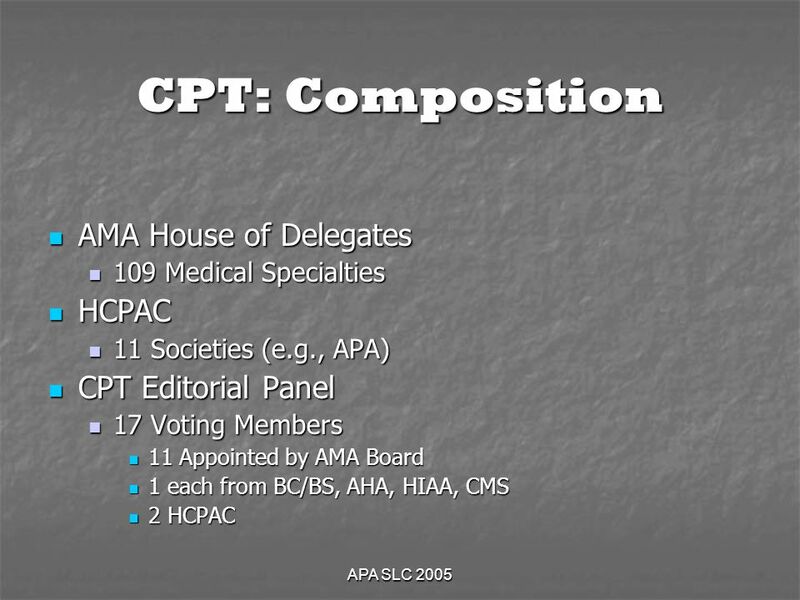 32 APA SLC 2005 Time: Definition AMA Definition of Time AMA Definition of Time Physicians also spend time during work, before, or after the face-to-face time with the patient, performing such tasks as reviewing records & tests, arranging for services & communicating further with other professionals & the patient through written reports & telephone contact. 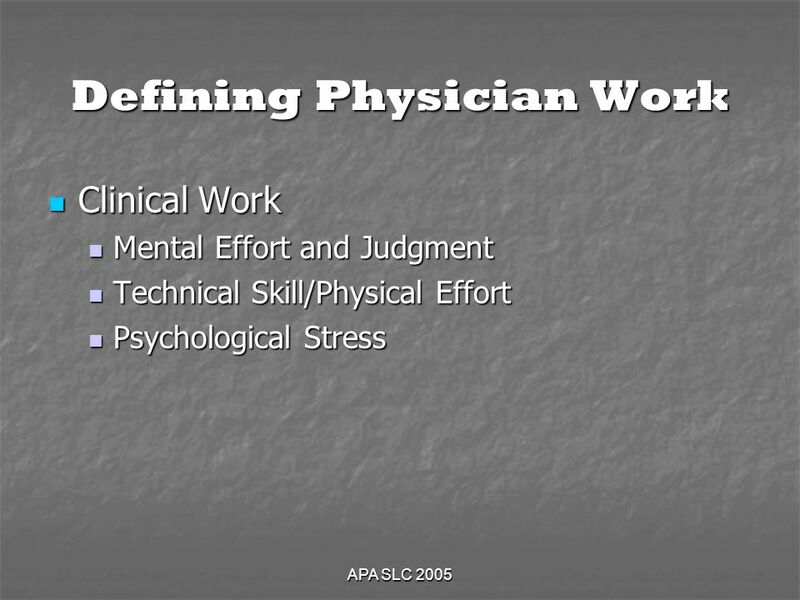 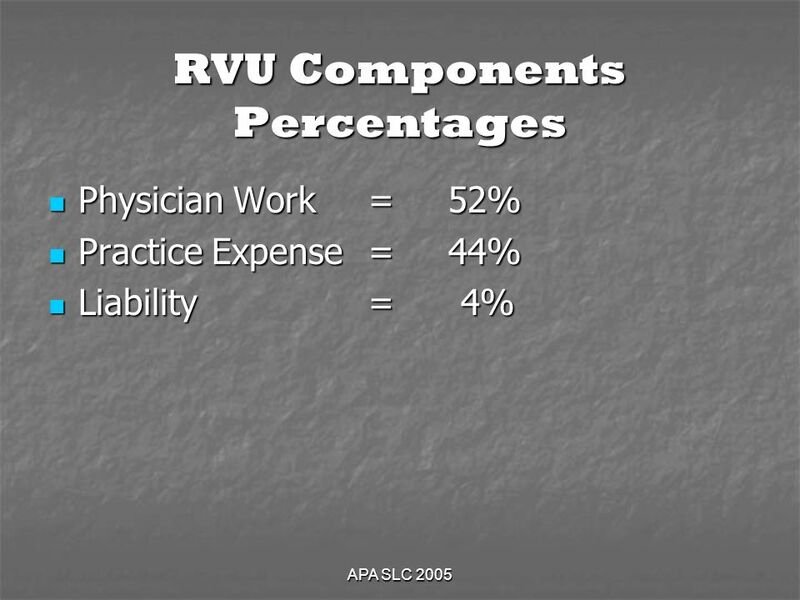 Physicians also spend time during work, before, or after the face-to-face time with the patient, performing such tasks as reviewing records & tests, arranging for services & communicating further with other professionals & the patient through written reports & telephone contact. 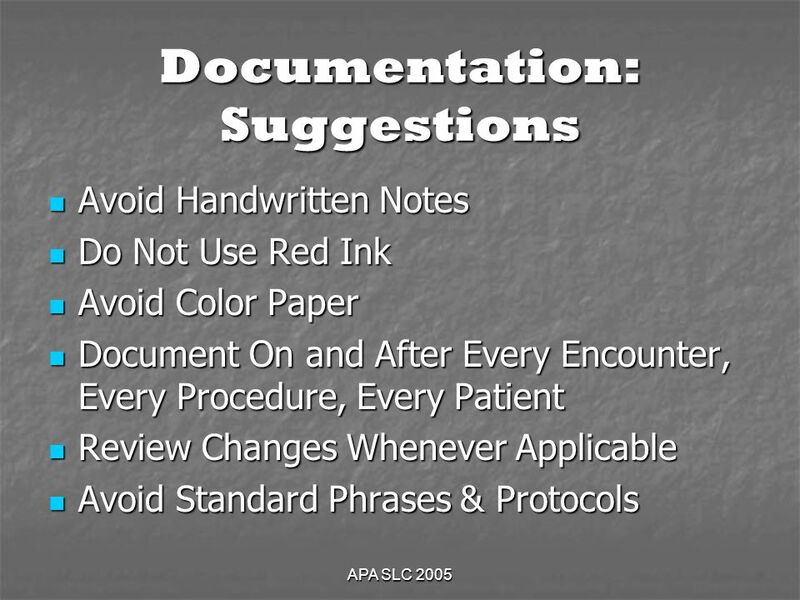 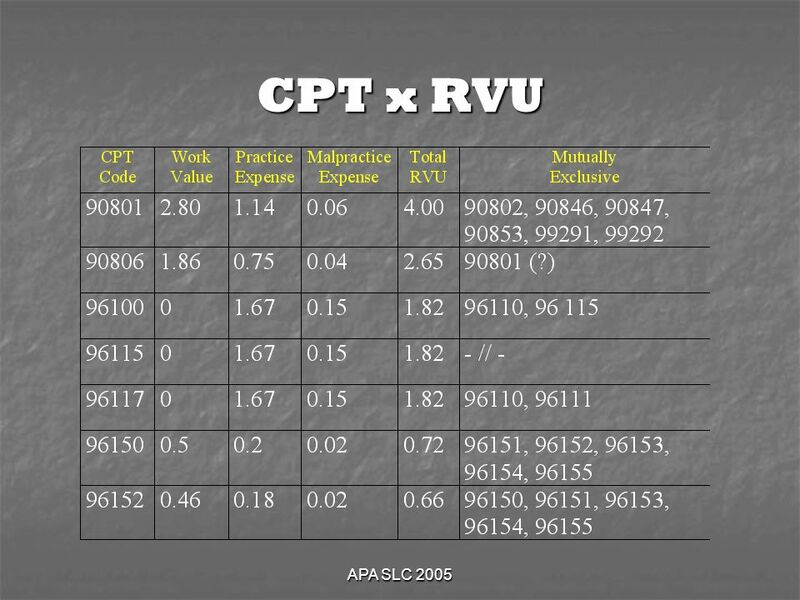 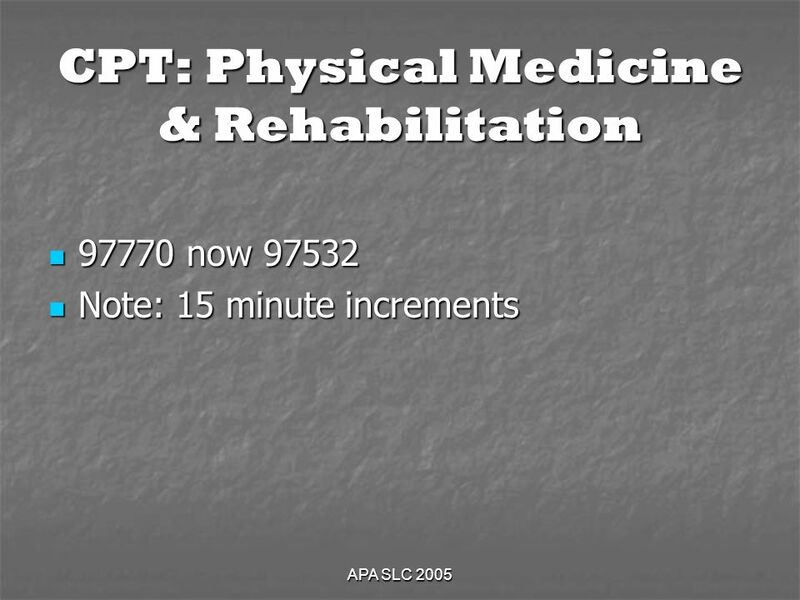 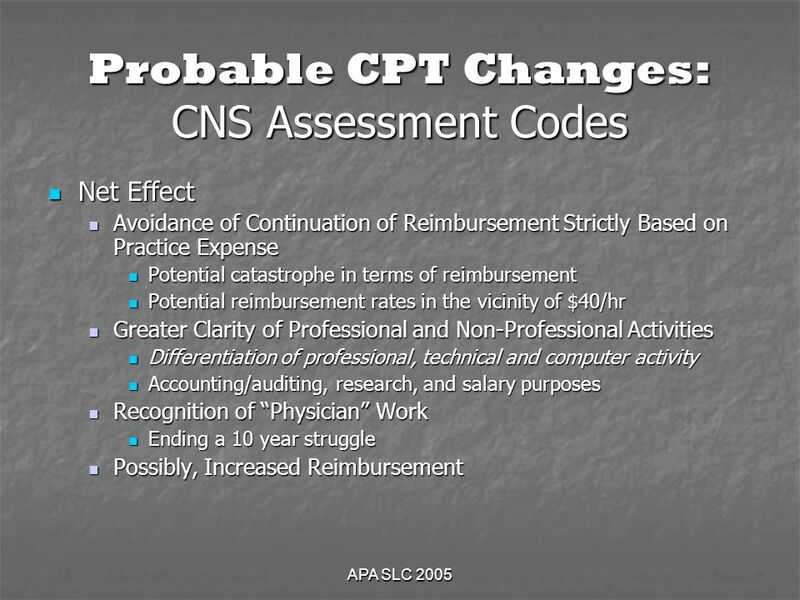 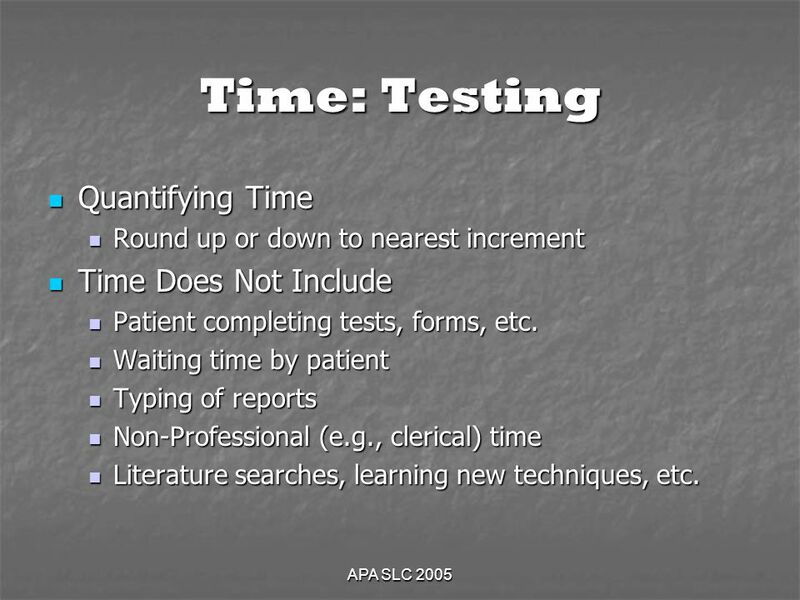 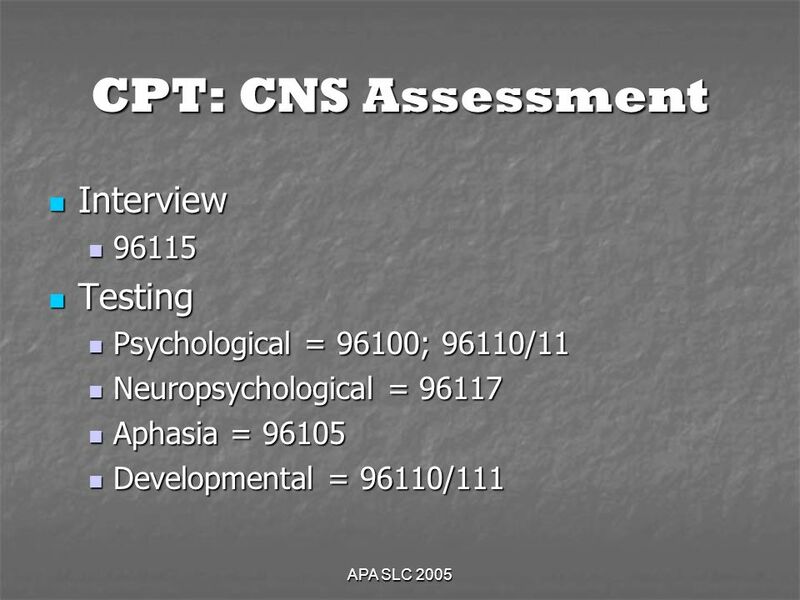 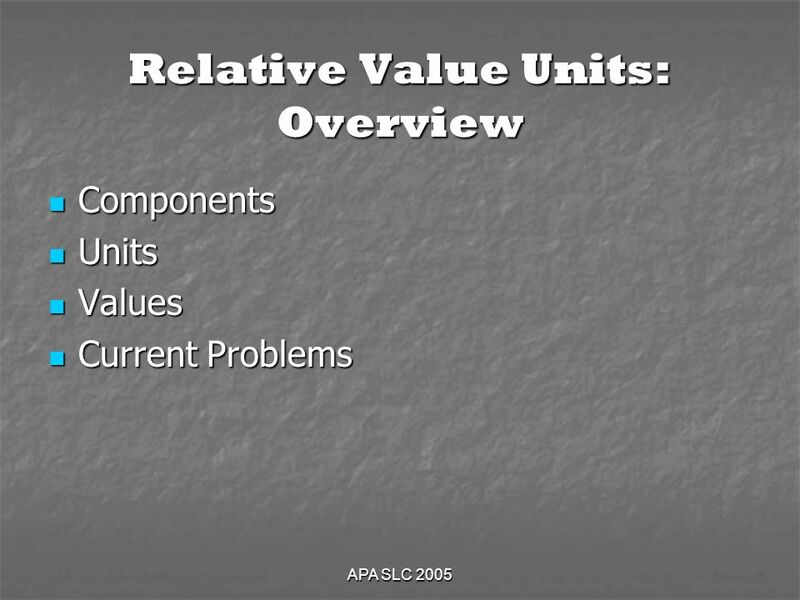 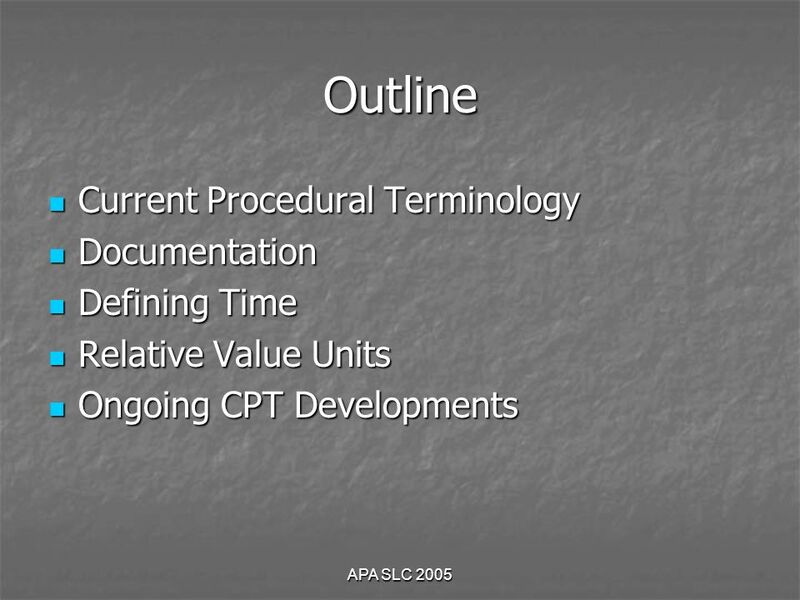 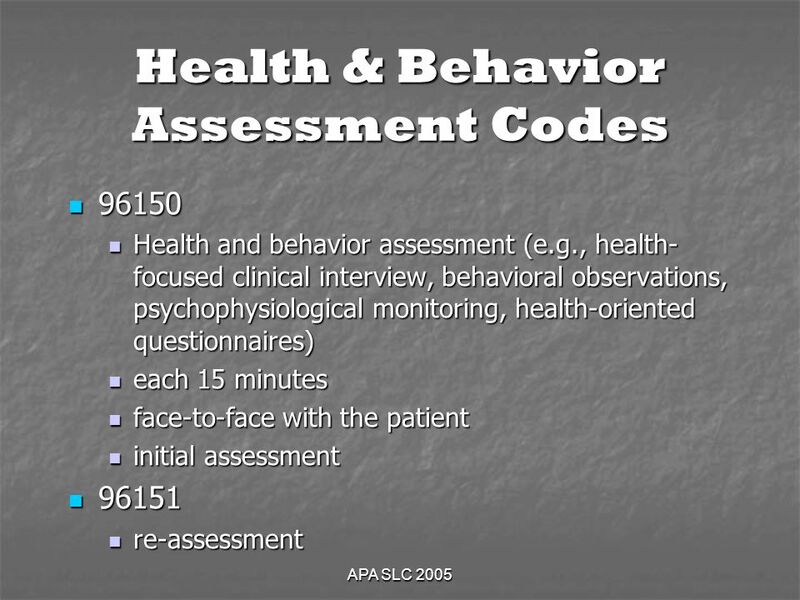 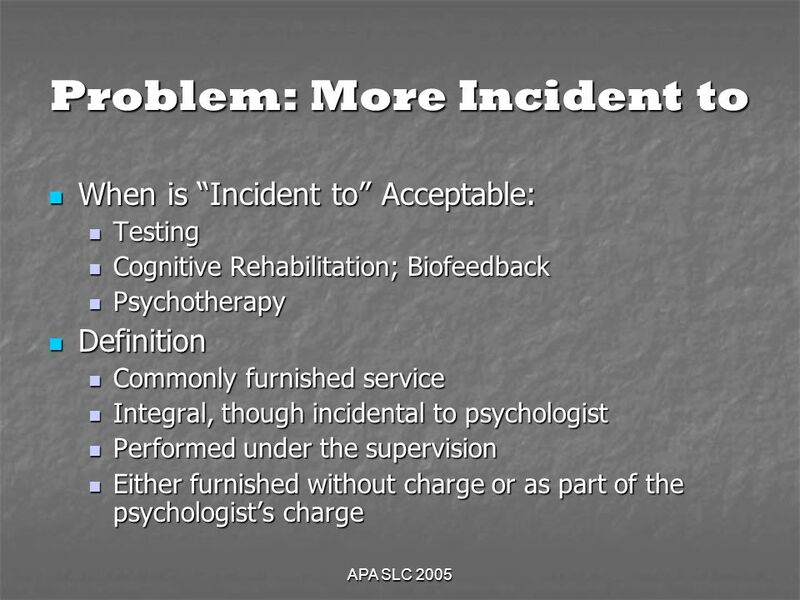 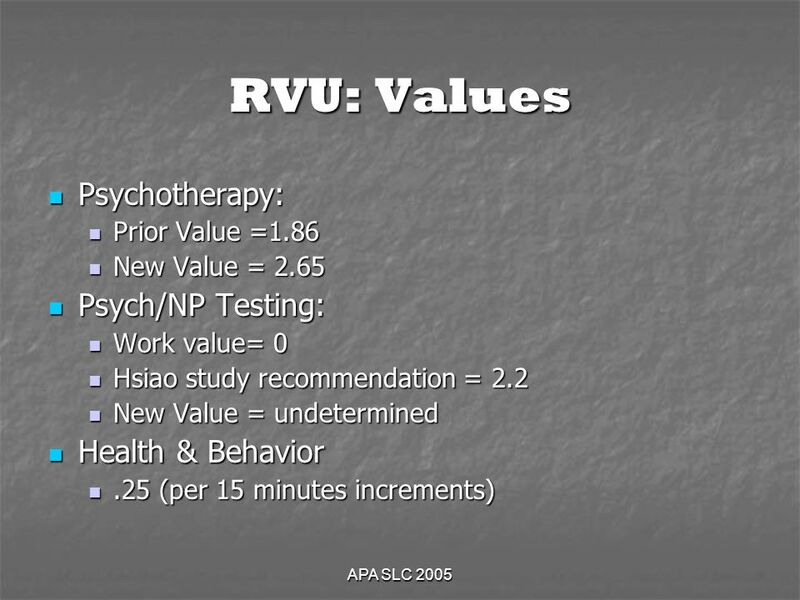 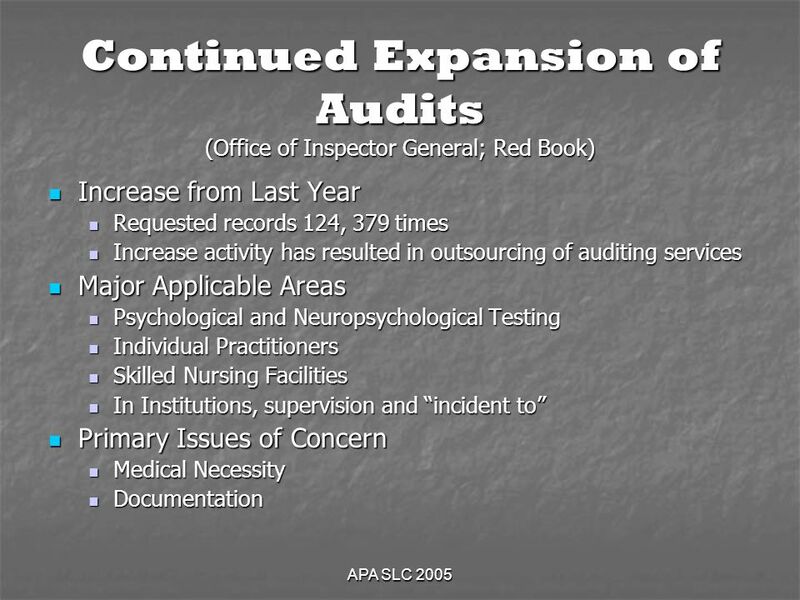 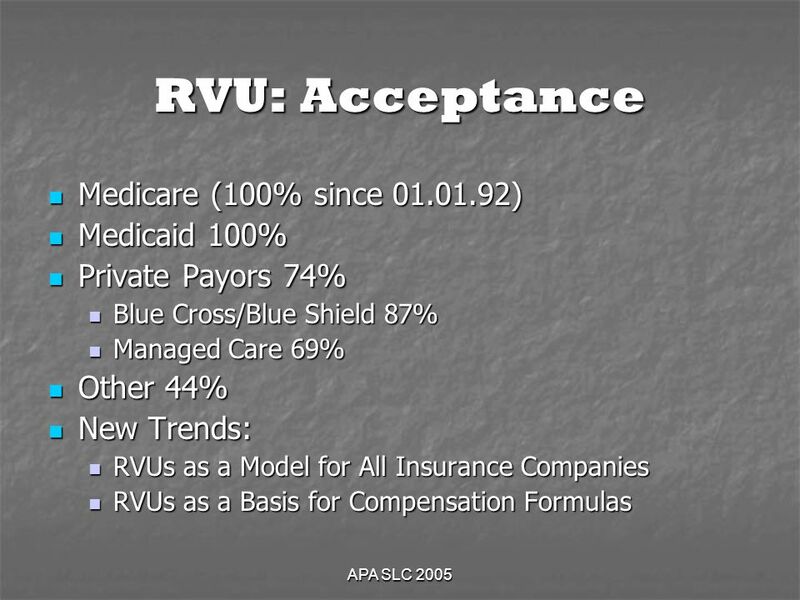 33 APA SLC 2005 Time: Testing Quantifying Time Quantifying Time Round up or down to nearest increment Round up or down to nearest increment Time Does Not Include Time Does Not Include Patient completing tests, forms, etc. 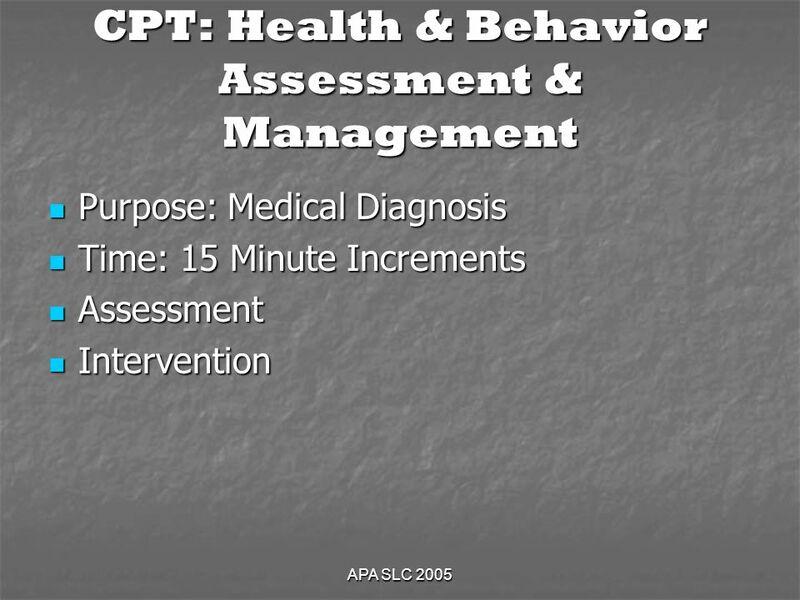 Patient completing tests, forms, etc. 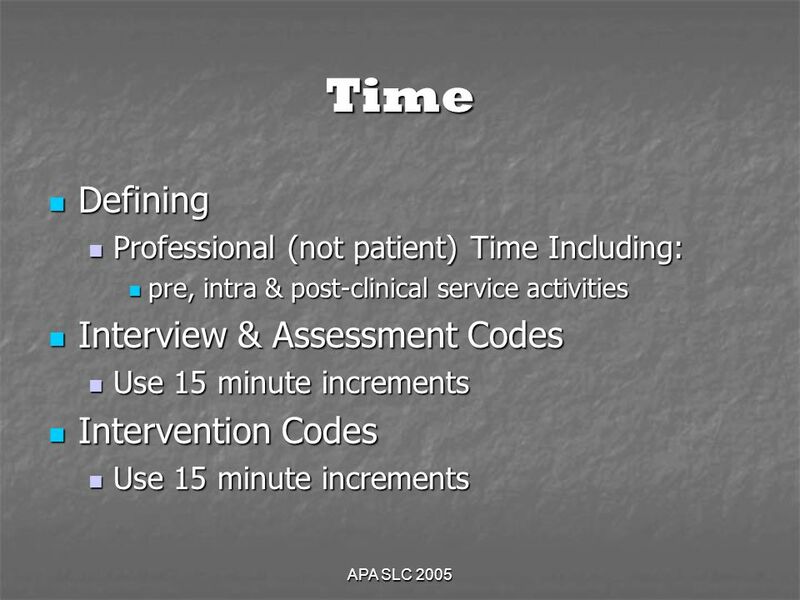 Waiting time by patient Waiting time by patient Typing of reports Typing of reports Non-Professional (e.g., clerical) time Non-Professional (e.g., clerical) time Literature searches, learning new techniques, etc. 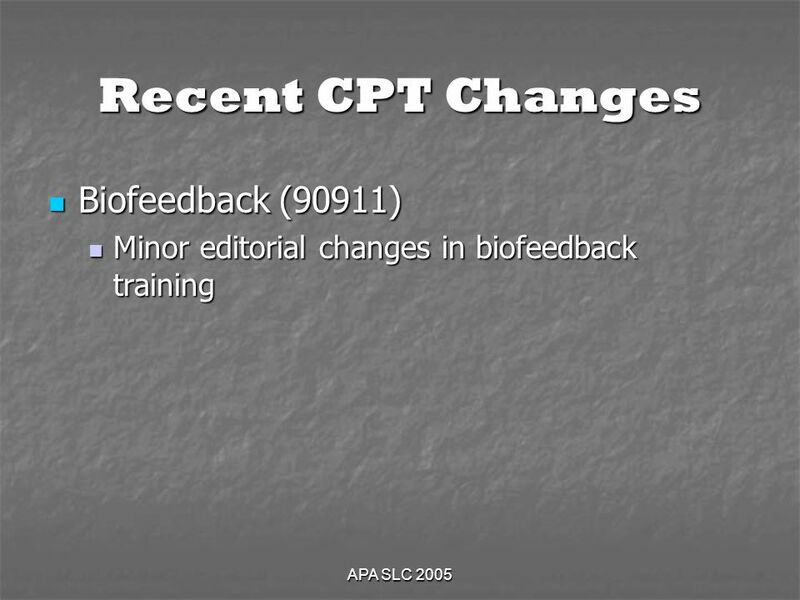 Literature searches, learning new techniques, etc. 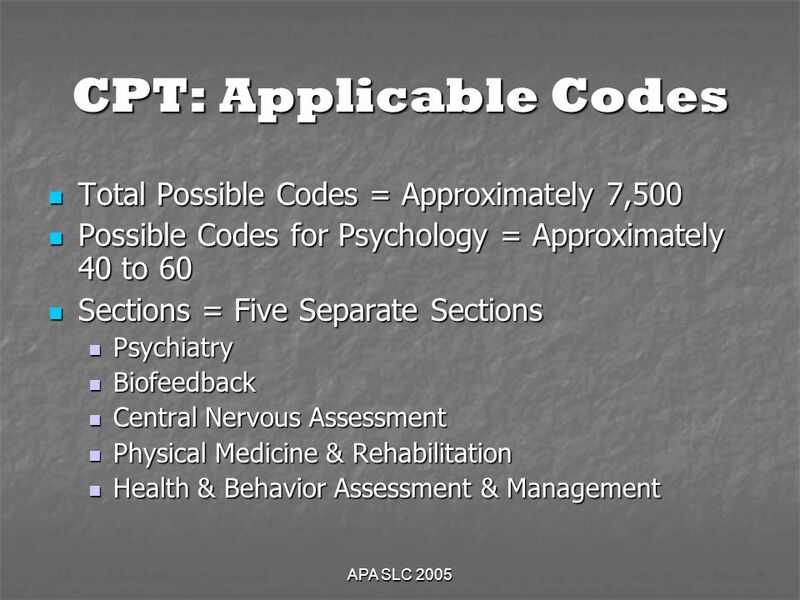 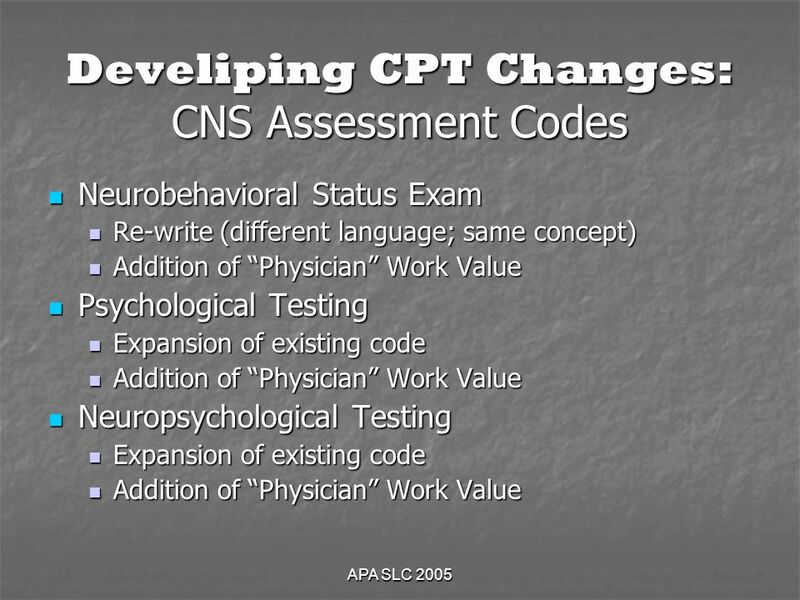 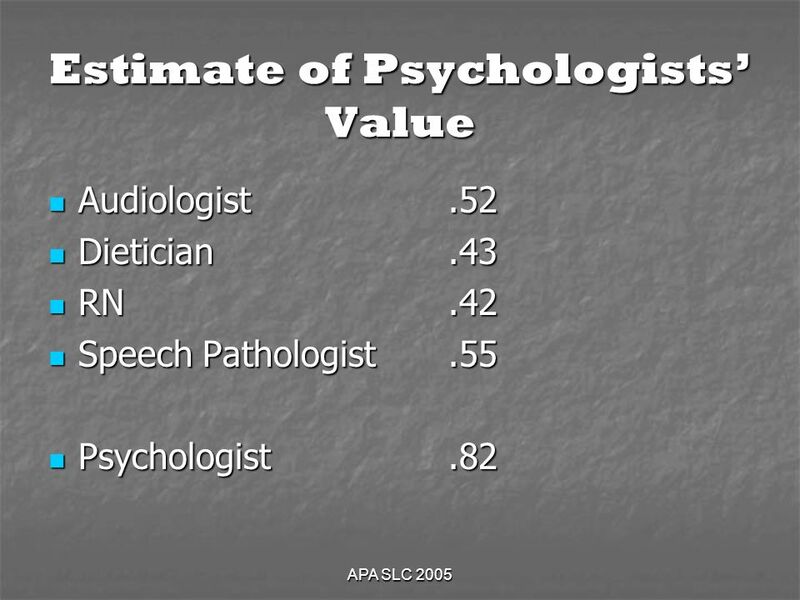 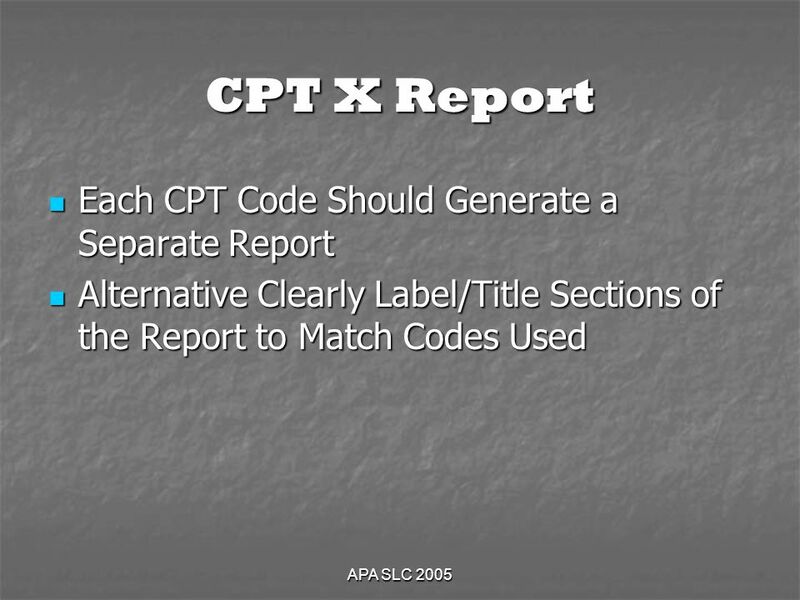 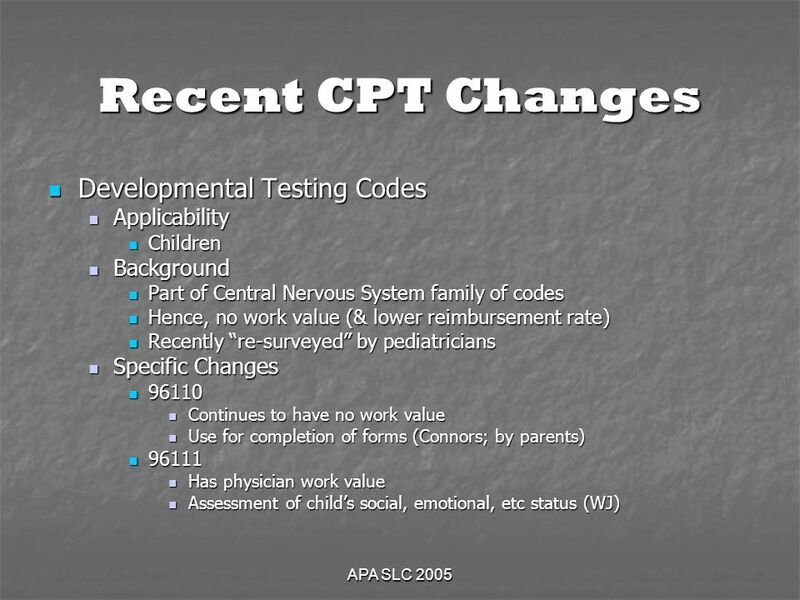 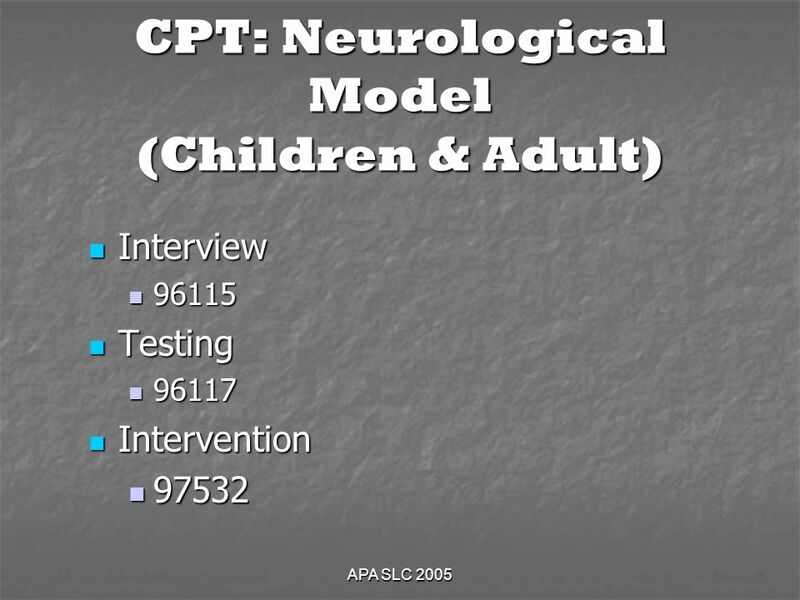 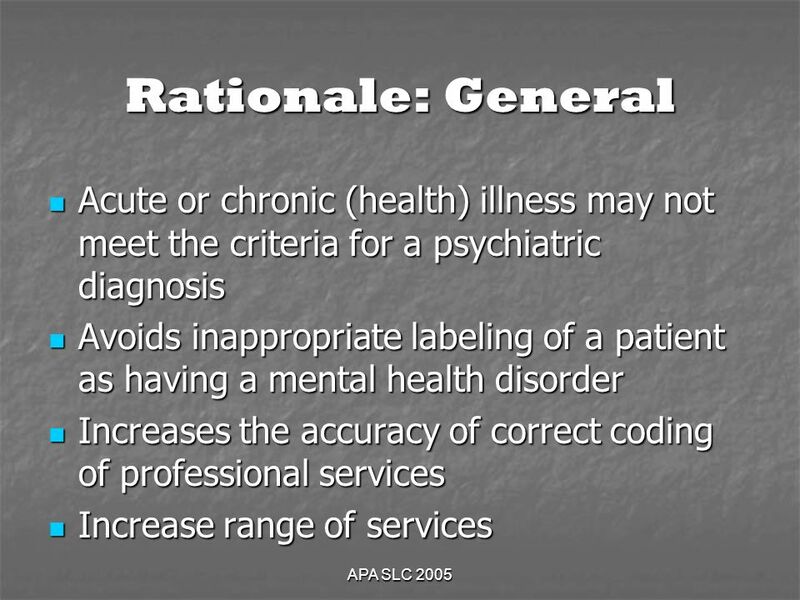 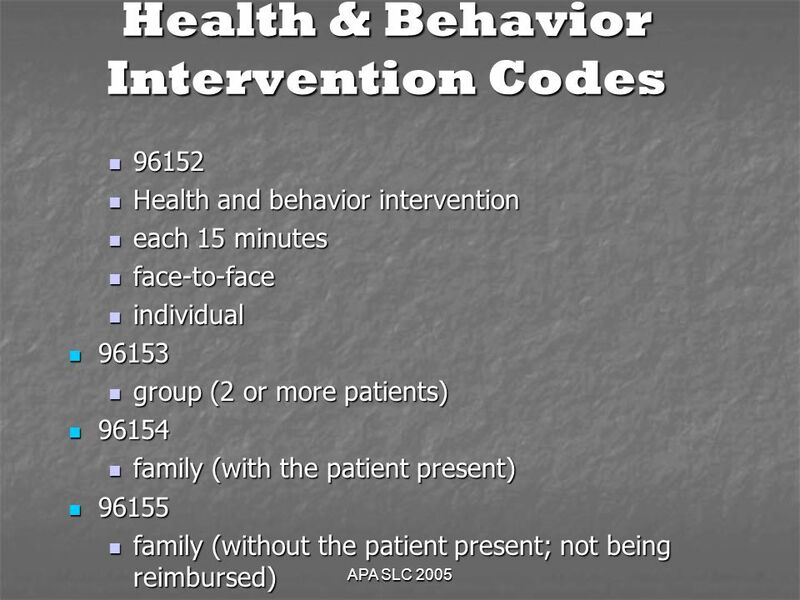 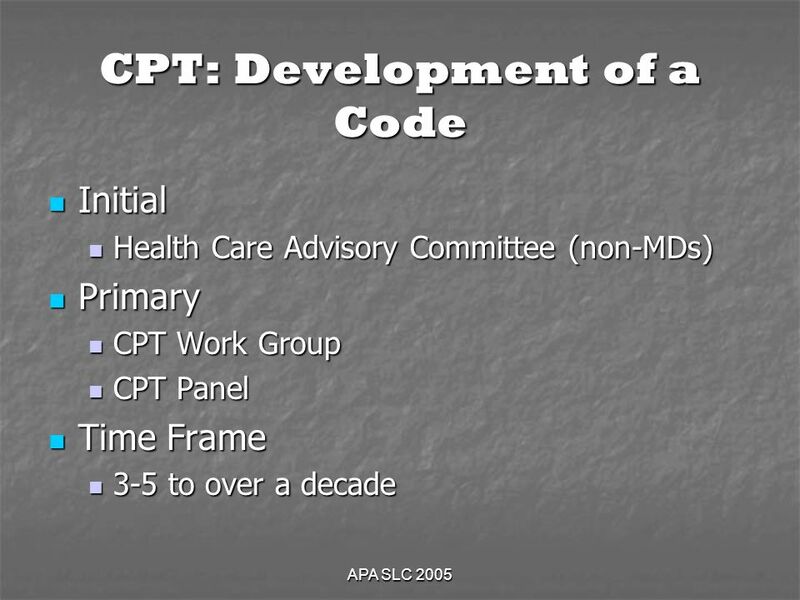 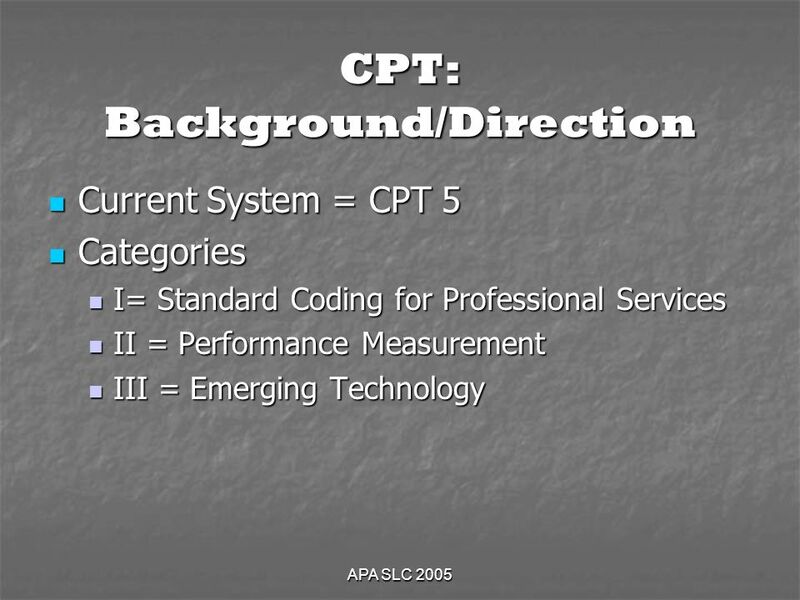 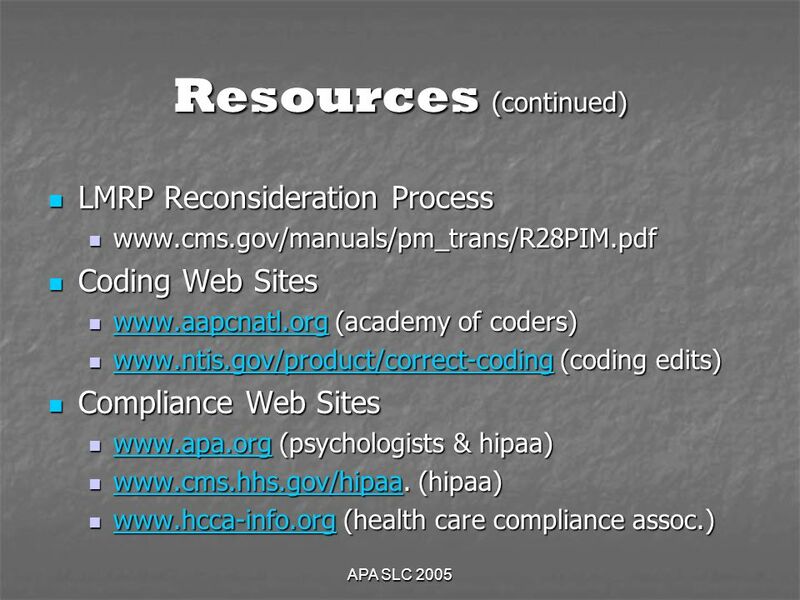 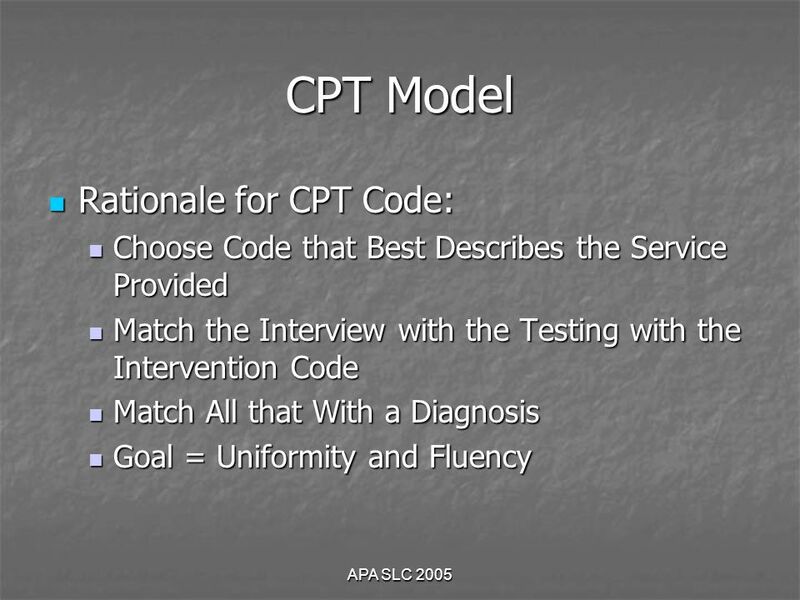 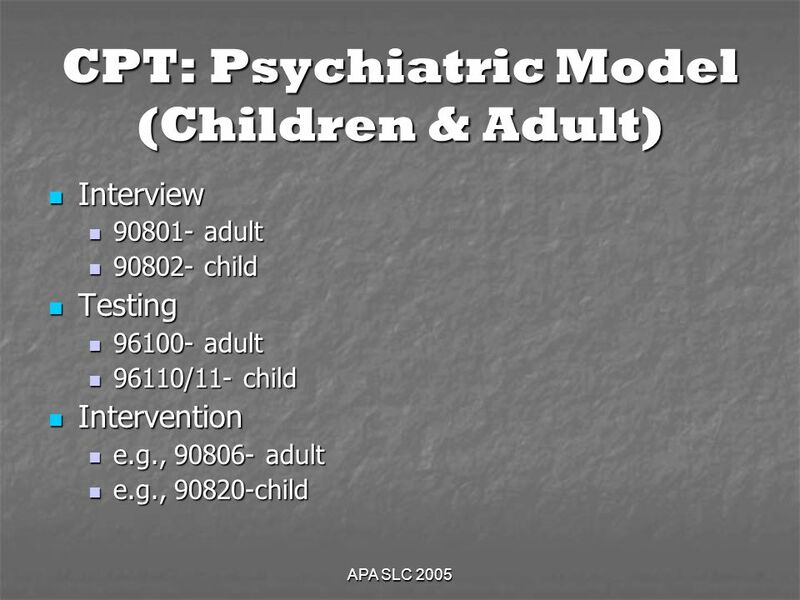 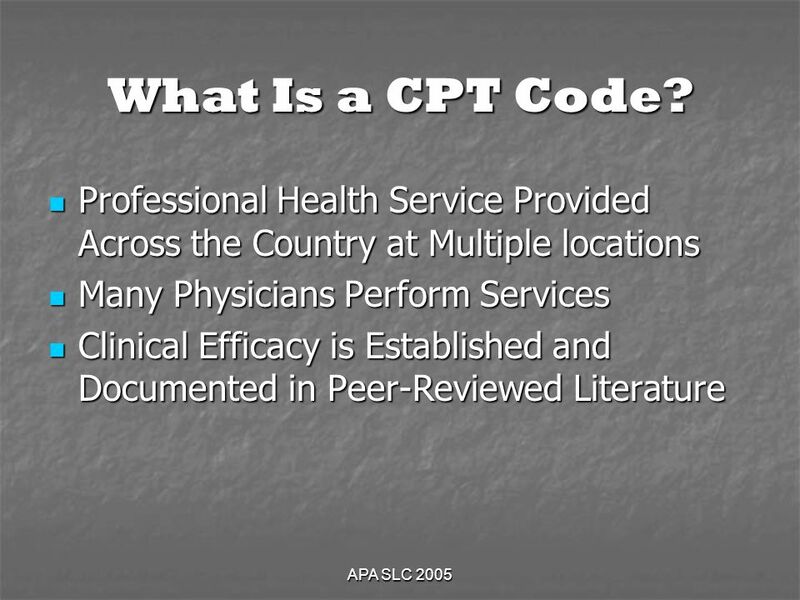 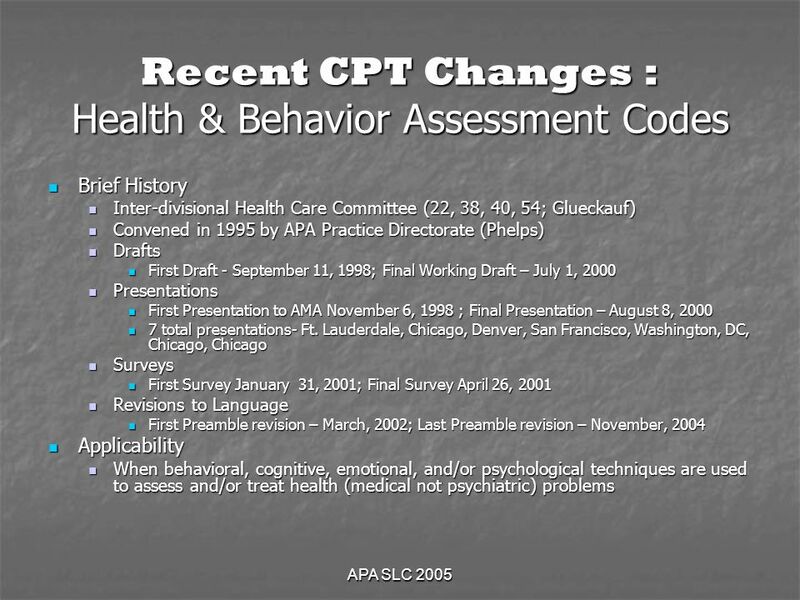 Download ppt "APA SLC 2005 Recent Changes in Coding and Related Issues American Psychological Association American Psychological Association State Leadership Conference." 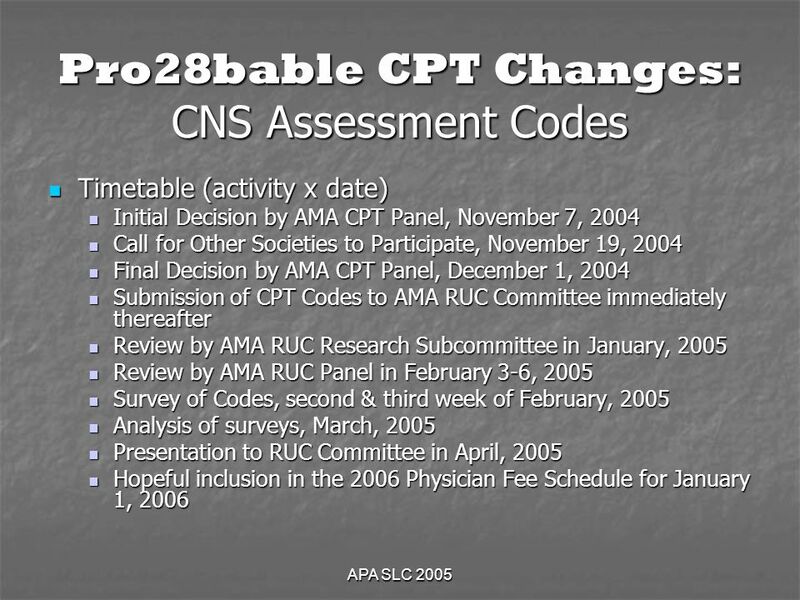 1 Laboratory RFP Q & A session Simon Everitt / Joy Cooper Planning and Funding 18 th August 2006. 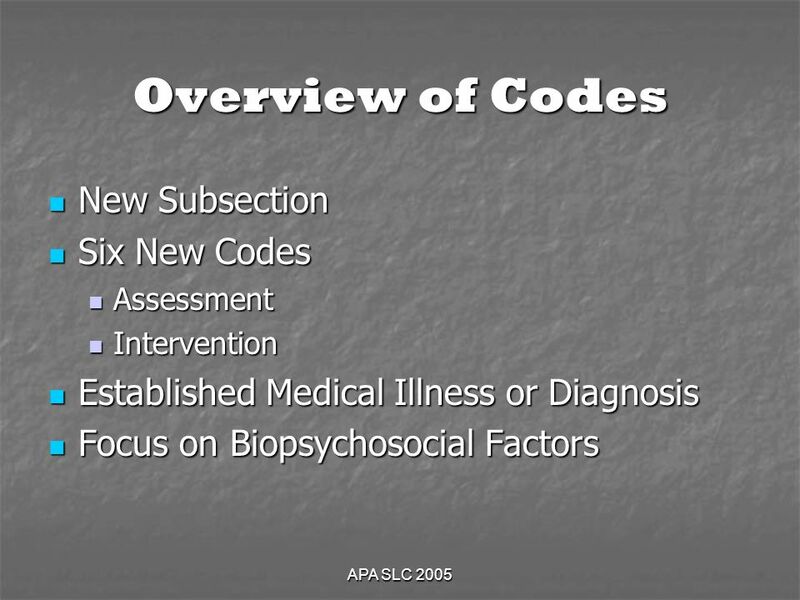 NAN 2004 Advanced Coding, Documentation and Billing Workshop for Neuropsychological Services National Academy of Neuropsychology Seattle, Washington November. 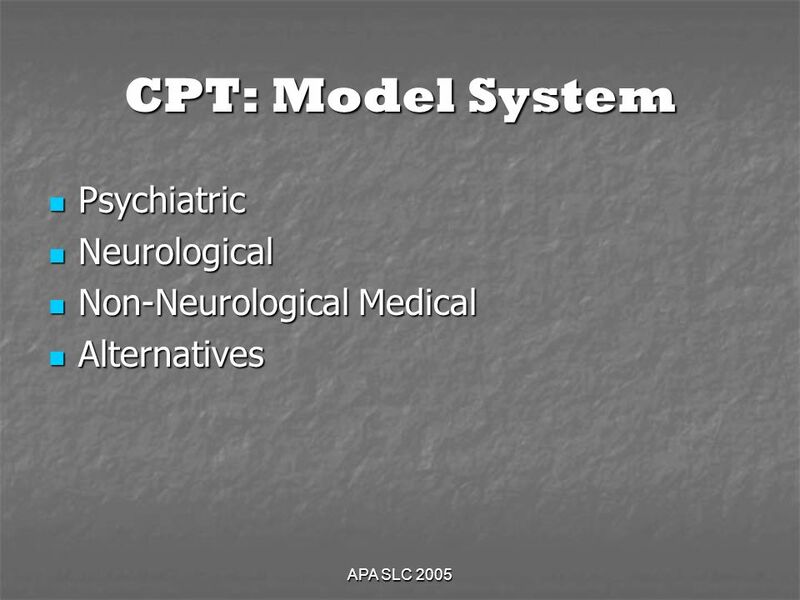 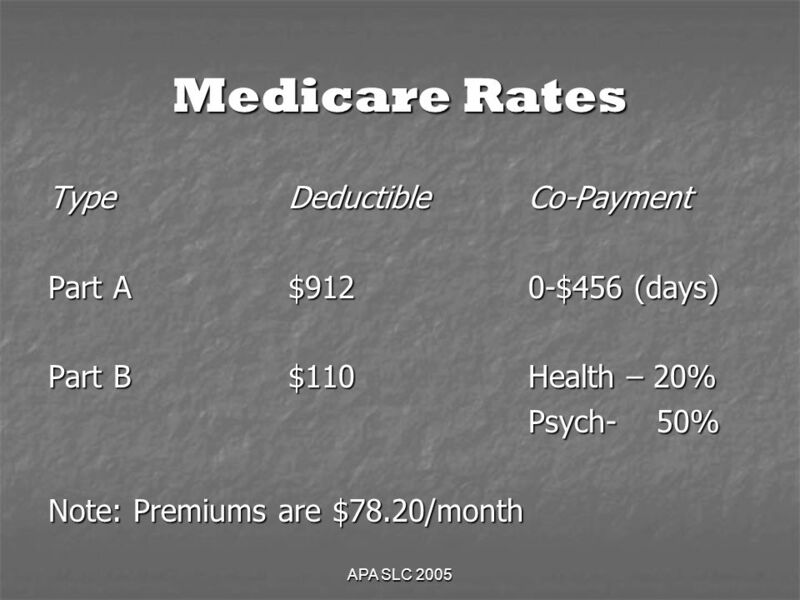 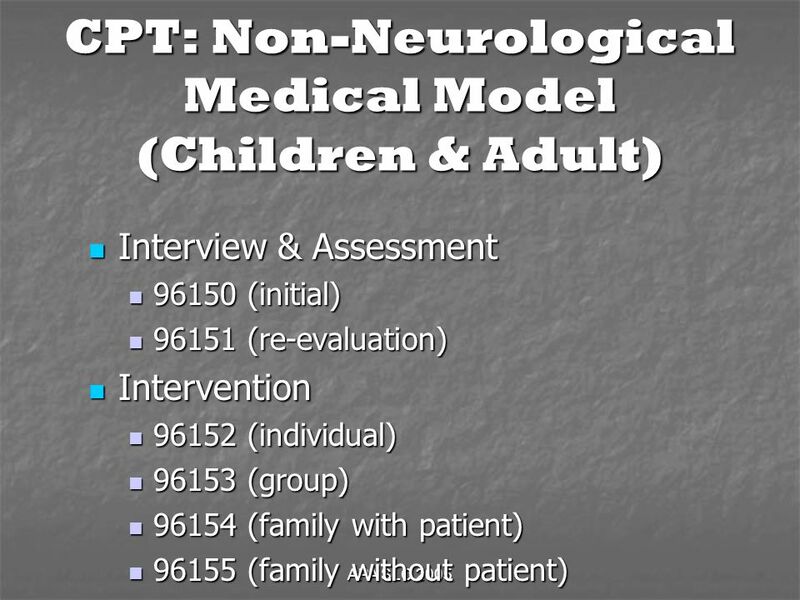 Interfacing Science, Politics and Economics: How Medicare and the AMA Affect the Practice of Psychology University of Georgia Antonio E. Puente. 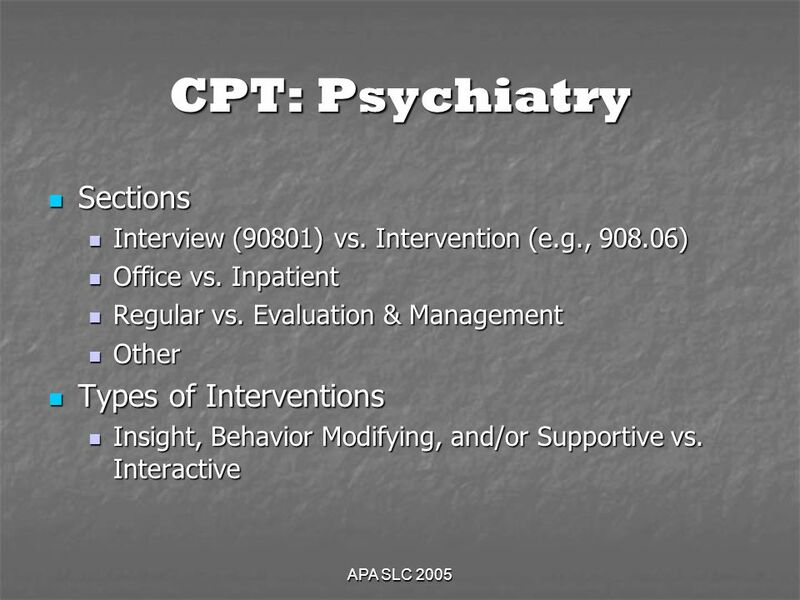 Aug 7 09 Co-Occurring Service Array Psychiatric Evaluation Comprehensive Evaluation Medication Monitoring Medications Clinical Consultation Family Therapy. 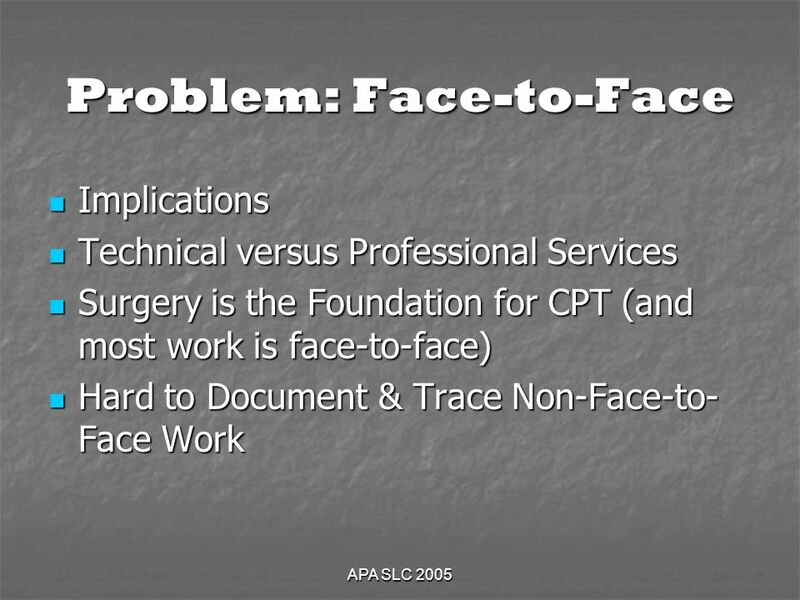 EMPOWERING PHYSICIANS TO DELIVER THE BEST PATIENT CARE Slides courtesy of: Richard W. Waguespack, MD, FACS President Elect, AAO-HNS, Former CPT Editorial. 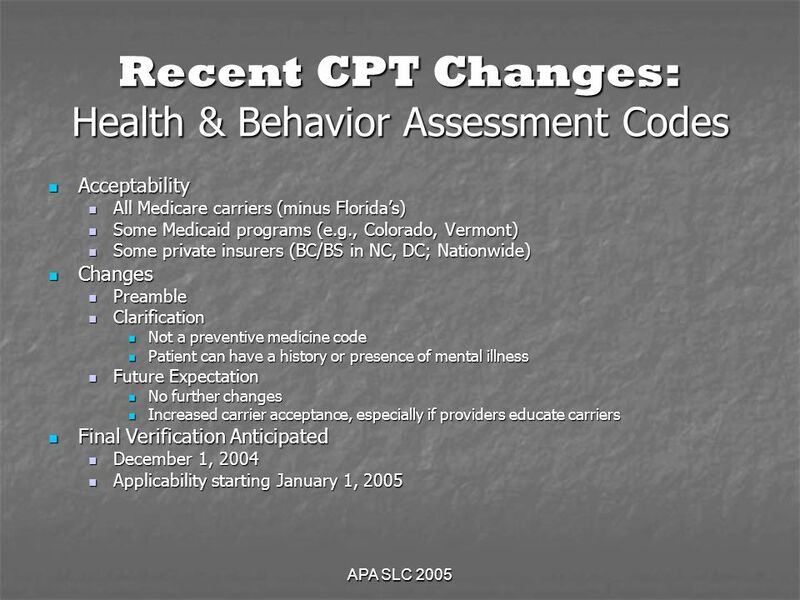 University of Florida Health Science Center/Jacksonville 5th Annual National Congress on Health Care Compliance 3.06 - The Fundamentals of Coding for Non-Coders.